Updated at 4 p.m. with additional reporting and photos. 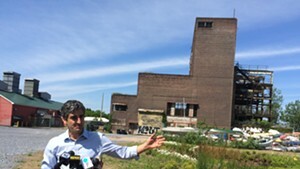 Declaring that he would "not risk Moran becoming another Burlington Telecom," Burlington Mayor Miro Weinberger this afternoon announced he is scrapping the Kiss administration's stalled plan for a Scottish company to build an ice-climbing facility in the former power plant on the Burlington waterfront. Weinberger declared in an "Open Letter to the People of Burlington" that the city must not serve as the developer of a "complicated, speculative, commercial real estate venture." Making note of the BT-related downgrades in Burlington's credit rating, the mayor added that "now is not the time for further speculative financial adventures by the city." Instead, Weinberger unveiled a "five-point action plan for near-term progress" on the portion of the waterfront near the Moran plant. In addition to initiating a new competitive process to determine the future of the hulking and scarred 59-year-old structure, Weinberger said the city will seek a permanent home for the Lake Champlain Community Sailing Center, which was originally part of the Moran plant redevelopment plan under former mayor Bob Kiss. Sailing Center president Marc Sherman was on hand at the mayor's waterfront press conference to voice approval for Weinberger's new approach. The "action plan" also includes an envisioned $3 million investment to upgrade the portion of the "beloved" waterfront bike path between Perkins Pier and a point a few hundred yards north of the Moran plant. Weinberger added that he wants to create "a world-class skate park" as part of a set of enhancements to a six-acre parcel of land surrounding the Moran plant. Weinberger explained that he wants to use a total of about $5 million worth of Tax Increment Financing (TIF) funds for the waterfront to help pay for the skate park and the bike path upgrade. Burlington voters will have the ultimate say on the outcome of this new process, most likely through a binding vote on TIF investment in the Moran redevelopment. A few local business leaders and a key member of the city council were present to signal their approval for Weinberger's "no-go" decision on the ice-climbing project. Retired Merchants Bank president Joe Boutin (pictured), who headed a citizens' committee created to review Kiss' Moran plan, said he is pleased that Weinberger is addressing financing, cost and timing concerns that the panel had raised about the project. Al Gobeille, president of the board of the Burlington Business Association, was also in attendance. City Councilor Karen Paul, an independent with a seat on the city's Board of Finance, said Weinberger is making a "prudent departure" from a proposal that the mayor called "the most complicated financial deal I have seen in my 15-year career specializing in complex public-private partnerships." Paul, a professional financial adviser, said the alternative put forward by Weinberger is "more likely to achieve the best outcome for Burlington." Weinberger's proposal to use about $5 million in TIF funds — $2 million to complete the Waterfront North project (including skatepark construction) and $3 million to rebuild part of the bike path — is meeting with broad general approval from various points along the political spectrum. State Sen. Vince Illuzzi, the Republican candidate for auditor, has deep experience wtih Burlington's waterfront TIF as chairman of the Senate Economic Development, Housing and General Affairs Committee. Illuzzi notes that the first TIF authorized for the waterfront was passed in the mid-'90s through a Senate committee on which he served. He also played a role in Montpelier in authorizing a second waterfront TIF in 2008. Illuzzi suggests that Weinberger's plan to use the mechanism to make Moran-related infrastructure improvements seems sound. “It's a win-win for the state, a win-win for the city, and I look forward to working with him on this,” Illuzzi says. Weinberger's decision to abandon the Ice Factor component of Moran redevelopment is not receiving unanimous support, however. Tiki Archambeau, chair of the Progressives' Burlington committee, says the mayor is making a bad move. Archambeau is critical, for one thing, of Weinberger's comparison between the Moran development plan adopted during the Kiss administration and the Burlington Telecom debacle that erupted during the Progressive mayor's tenure. “BT is completely unrelated to Moran,” Archambeau points out. At his press conference, Weinberger framed his new plan as a potential way to help restore the city's credit rating. He suggested that Moody's may look favorably on what he described as a more prudent approach to redeveloping Moran. Weinberger noted that the city has spent $750,000 in capital funds on the redevelopment plan in the past four years while lending $500,000 from its cash pool to the project. “It would take at least an additional year and an estimated $900,000 of at-risk public spending to close the deal,” the mayor said. “It may be some time before we can recover the money that has been committed by the city,” he noted.